We’re kicking off the list with some sock must haves. Groomsmen socks can really tie a look and theme together and makes the wedding boys look smart and put together. The best way to tackle this look is to go matchy matchy. This is a little detail that can get forgotten amongst tuxedos and shoes but it’s just as important. So no excuses, get some matching socks to complete your groomsmen look! 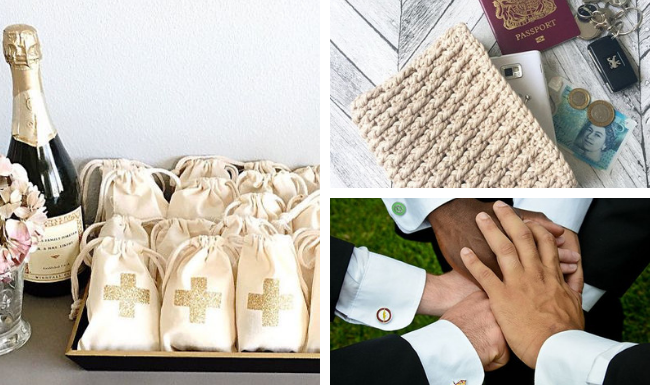 Why not give socks to your groomsmen as a little gift? Bridal and bridal party dressing gowns are quite frankly adorable and a must have for a bride and her favourite girls. This is a little detail for when everyone’s getting ready on the big day. Not only will they look cute in the wedding phots but they also double as the perfect keepsake for you all to remember this special day. We highly recommend silk ones for an extra luxurious feel. In line with wedding socks, cufflinks are stand as an important little detail that you shouldn’t forget as a groom with groomsmen. This tiny detail can transform the feel of a suit or tuxedo and gives you loads of freedom to be creative and fun. Pick cufflinks that mean something to you; we suggest ones with a message, character cufflinks, and comical ones. They are a quick way to complete a look and truly make it your own. Like the socks, why not give cufflinks as a gift to your groomsmen too. You would be surprised by just how many venues operate strict ID and payment policies. Even if you’ve got a prepaid bar, if the bar tab runs out then venues can start charging for drinks up front. In the craziness of wedding planning we suggest making sure both the bride and groom and everyone else brings some identification and a little bit of cash to cover the bill of any unexpected costs on the big day. We’d hate for the party not to carry on into the early hours. You sent out invitations MONTHS ago and gave everyone plenty of time to rsvp. However, you’re bound to get some last minute attendees or plus ones. If the venue can cater for possible extras it’s a fab idea to bring some extra wedding stationery with you to make some last minute place cards and other little pieces. This will help everyone to feel welcome and your day to run as smoothly as possible. This tip is an absolute must have. Bridal emergencies really do happen and that’s why a bridal emergency kit is a small thing that you really need to remember for your big day. We suggest a little bag filled with plasters, needle and thread, tampons, hair spray, white chalk (yep, it can save wedding day pictures if you get a mark on a white dress), and any other little bits that could come in super handy if worst case scenario takes place. Being prepared is the best way to tackle unexpected wedding day issues. When we think of our dream bridal wedding shoes we think of brands such as Louboutin’s and Manolo Blahnik’s. They’re high, they’re sparkly, and they’re gorgeous. However, they are, usually, also super painful. Most heels can be guilty of this. We suggest bringing a spare pair of comfy, flat shoes just in case you find yourself in high heeled despair. Plus, flats are so much easier to dance in and we have our priorities situated rightly so on the d floor. The general rule of thumb is that its lucky to have rain on your wedding day. Lucky or not, it can also be really inconvenient when the entire wedding party has spent hours getting picture perfect for your big day. Not only is it a great idea for the bridal party to remember to bring along a few little umbrellas for themselves but perhaps also consider having a few on stand by for any guests that may have forgotten to bring them. This is especially a good idea if you’ll be spending any time outdoors on your big day. On the other hand, if the suns out in full force it may be a good idea to sort some sunglasses for the groomsmen (and bridesmaids too!) on the big day. Matching sunglasses will ensure everyone looks great and in comfortable in bright light! Plus sunglasses can add a little fun on the big day and look great in photos. You can also make them your own by choosing whether to for traditional shades or quirky ones! Sunglasses are definitely a little detail you don’t want to forget! Last but not least, flower petals for flower girls is an adorable little detail to remember on your wedding day. Most florists do offer petals as part of wedding flower order but just in case it is always a good idea to put them on the list that you give to your florist. Likewise, floral crowns for flower girls also fits into his category. These are small details that can have a huge effect on the look and feel of your wedding ceremony and photographs and plus they’re also unbelievable cute. So when you’re planning your big day don’t forget flower girl petals!